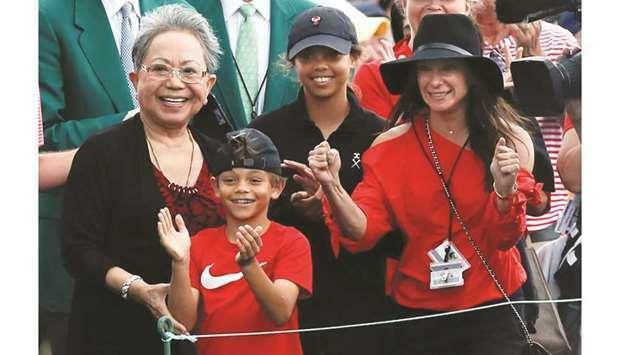 (MENAFN - Gulf Times) Tiger Woods finally showed his children why their father kept fighting through pain trying to swing golf clubs, his victory Sunday at the Masters literally a win for all ages. 'It's special to me, to my friends and family, Woods said. 'And I think everyone who was here got a chance to witness something that was amazing. 'For them to see what it's like to have their dad win a major championship, I hope that's something they will never forget, Woods said. 'I hope they are proud of their dad. 'This has meant so much to me and my family. It's something I'll never ever forget, Woods said. 'To have them there and then now to have them see their Pops win, just like my Pops saw me win here, it's pretty special. 'My dad shouldn't have come in ‘97. He had heart complications and wasn't supposed to fly, Woods said. 'But he flew and came. Gave me a putting lesson on Wednesday night and the rest is history. 'She's driving me to the tournaments when I'm 11 years old, the pee wee tournaments when I start at 7 a.m. and she's unfolding the road map. She did all that, Woods said. 'She's always there. She's always present in every round I play. 'The kids are starting to understand how much golf means to me and some of the things I've done in the game, Woods said. 'Prior to comeback, they only knew golf caused me a lot of pain. If I tried to swing a club I would be on the ground and struggled for years and that's basically all they remember. 'Luckily I've had the procedure where that's no longer the case. We're creating new memories for them and it's just very special.Woods said his children's love helped him withstand the down times when he feared even walking without pain. 'It means the world to me, their love and support, Woods said. 'I just can't say enough about how much that meant to me throughout my struggles when I had a really hard time moving around, just the infectousness of their happiness. I was going through a tough time physically. 'I was very fortunate to be given another chance to do something I love to do, but more importantly, I've been able to participate in my kids' lives in a way that I couldn't for a number of years. 'For a while there I couldn't even walk. Now I'm able to play golf again and do it at an elite level. I'm just very blessed to be able to have that opportunity again. Woods has no doubt where his most meaningful trip with the green jacket will come — his son's school class. 'I'm excited about show and tell at school, Woods said.